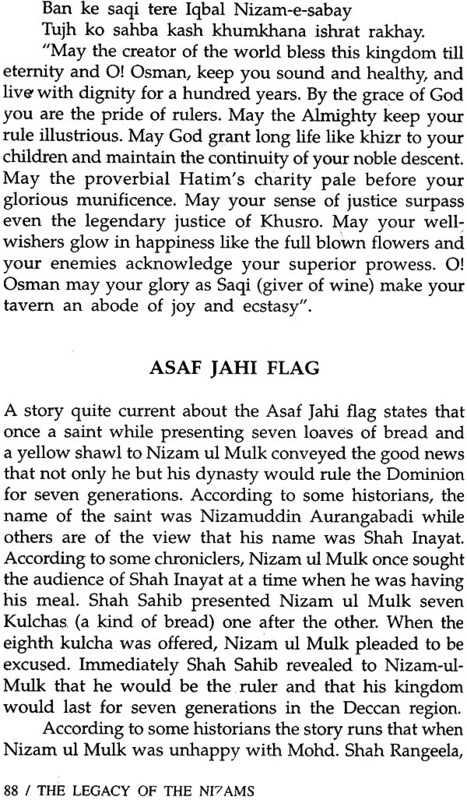 The Asaf Jahi dynasty ruled over the State of Hyderabad, which was not only the largest, but also the foremost in status and prosperity. In addition to its wealth, Hyderabad had been in the past a great seat of culture and learning. Turning back to the pages of history, one will find that Hyderabad in the 19th century was not only economically and educationally backward but its crippled finances, chaos and confusion, retarded the all-round development of the State. The untiring efforts of gifted rulers and administrators put the State on the right track. Initially, the pace of development was slow. The closing years of the nineteenth century witnessed a vast transformation in socio-economic and cultural fields. Gradually with the introduction of new trends in administration, the erstwhile State of Hyderabad became one of the best administered Princely States in India. During the last fifty years considerable historical and research work has been done concerning the erstwhile State of Hyderabad. The writing of history is not an easy task as it requires a deep insight into the march of events. However, some of the writers in recent times did not portray the real character and ethos of the State, as they did not have the biased knowledge of the Persian and Urdu languages and had a biased mind. It is the responsibility of a true historian to record facts free from prejudice and bias as historical works are a part of the national heritage for the present and future generations. Taking into consideration the above mentioned facts I have added new dimensions to my translation. I have tried to unearth and add material in many areas where additional information is needed. The additions are made in true perspective and in the interest of the general reader. My aim has been to highlight the theme of Hindu-Muslim unity, which existed in the Hyderabad State for centuries and show how the Nizams maintained it. 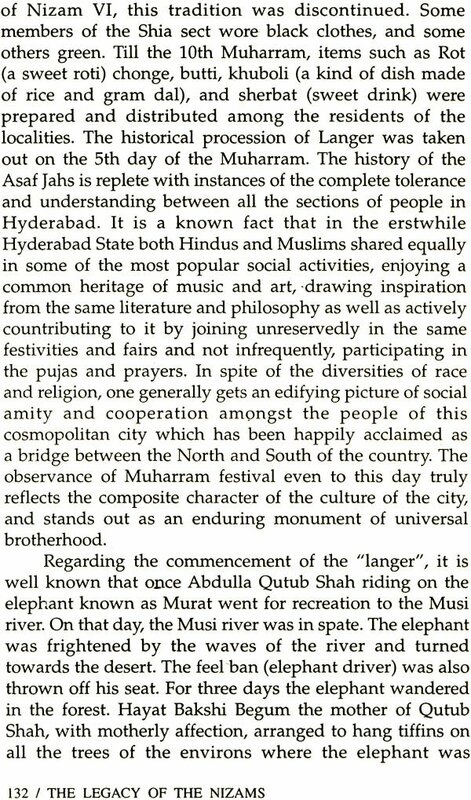 In my attempt to show the togetherness of the various communities which inhabited the State, I thought it befitting to show how this was done in the years gone by in the State of Hyderabad. I have consulted many papers and books and tried to balance the views expressed in the original version by presenting it in an unbiased manner. Mamlakat-e-Asafia is a good source material and reference book on the history of the Asaf Jahs amongst the other books on the subject. The author has particularly dealt with all the administrative departments and socio-economic developments which took place in the State. The major feature of the reign of Mir Osman Ali Khan Nizam VII, was the re-organisation of finances, re-classification of heads of revenue and expenditure and streamlining of all departments of administration. The Hyderabad Government promoted a policy of progressive development in the fields of agriculture, revenue, public works, industries, trade and commerce, medical, care veterinary, planning and transport among others. 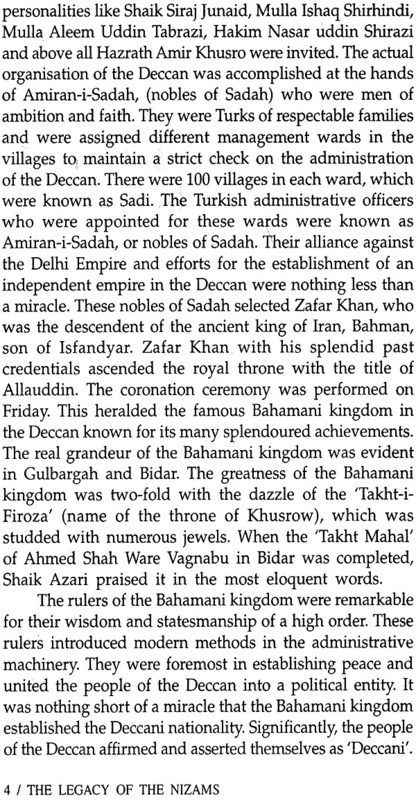 In the source, which has been consulted of the State, Mir Osman Ali Khan emerges as an enlightened ruler, a shrewd diplomat and a capable administrator. Though he was the richest man in the world, he disliked the gaudy pageantry of Princely India. He led a simple life and his simplicity set an example to others. His simple life was such that it could be followed by others as has rightly been said by Raja Narsing Raj in his speech on the occasion of the Silver Jubilee celebration of the rule of Mir Osman Ali Khan. "The respect won by our renowned Master is not because he is the king of an independent State but because of his deeds and actions. He not only established his authority in the hearts of his relatives, dependents and hereditary servants but he ruled over millions of hearts in and outside India. It is easy to become a sovereign but it is very difficult to become the ruler of action. Only those fortunate and exalted personalities become men of action for whom god has a special graciousness. The fountain of learning which is known the world over as "Osmania University" is only because of the laudable qualities of our Master Osman Ali Khan, which were apparent like broad day-light. Prevention of extravagance, check and unresonable and unnecessary expenses on festivals, simplicity in the conduct of life, all these are the consequences of the deeds of this holy personality. 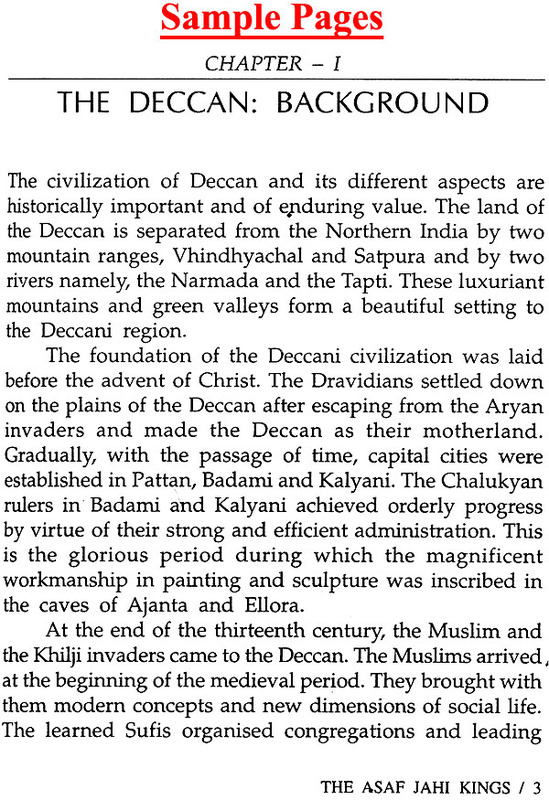 Today the Deccan, following his footsteps, saved itself from becoming dependent on others. Now, where are those personalities who made themselves the model of simplicity, inspite of having affluence, for the sake of their people, children relatives and nobles. It is quite impossible to present such an example now". According Lord Krishna whatever is done by eminent persons other men to do it, the world follows that which he makes as his standard. The translation of the book entitled Mamlakat-e-Asafia into English was a gigantic yet pleasant task. H.E.H. 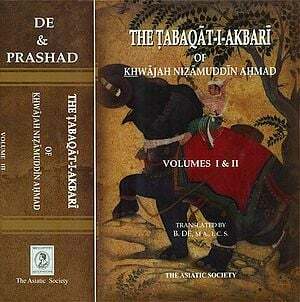 The Nizam's Urdu Trust had entrusted me with the translation of the volumes which has been successfully completed, though it took more than three years to do it satisfactorily. I am thankful to Prince Muffakharn [ah, Chairman, H.E.H. 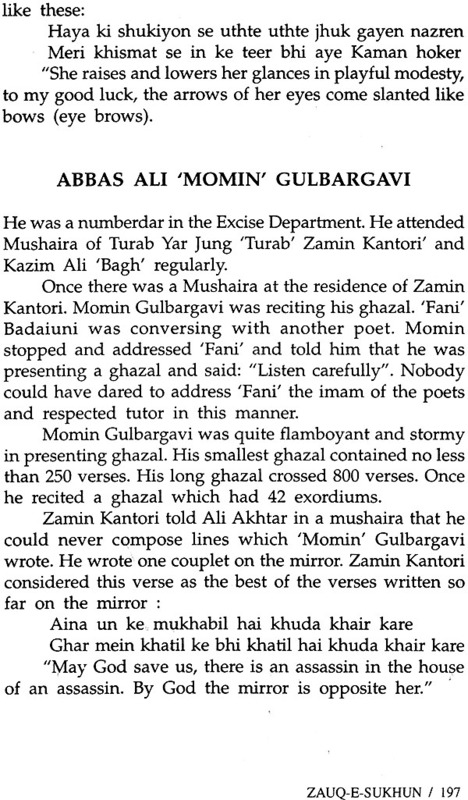 The Nizam's Urdu Trust for having entrusted me with the task of translation of such an informative and useful book. Hence in view of its importance and usefulness, its publication is of great interest as it is a complete and comprehensive history of the Asaf Jahi rule. I am thankful to Mr. Abdul Mahmood, Secretary, H.E.H. The Nizam's Urdu Trust and the staff of the Trust for their kind co-operation. I could not have accomplished this work but for the constant encouragement and co-operation extended by my husband, Narayan Raj. The erst-while Hyderabad State was the largest among the Indian States and was as large as France and Turkey. It occupied a unique position having its own currency, post and railways. During the benevolent rule of Asaf Jahi kings the State made remarkable progress and was ahead of the British Indian provinces in many respects, particularly in the sphere of education. By far the most important legacy left by the Nizams is that under their rule a composite culture evolved and flourished based on tolerance, justice and brotherhood. The founder of the dynasty Asaf Jah I laid the foundation of a pluralistic and secular society as defined in his will or testament. The successive Nizams nurtured the ideals of secularism without distinction of caste, creed or community. Hindus, Muslims, Parsis, Sikhs, Christians all participated in the governance of the State and enriched the common culture which came to be known as "Hyderabadi culture". In fact, Hyderabad State became a shining example of good governance based on tolerance secularism and equal opportunities for all. There was no concept of majority or minority. Hindus and Muslims shared power and were proud of the cultural heritage which they all shared. A number of books have appeared in Persian and Urdu on the Asaf Jahi Dominions written by historians and interllectuals of the sub-continent. However, there is hardly any book which highlights the distinctive role of Hyderabad as a symbol of culture and secularism. Recently an authoritative book has been published covering all aspects of Hyderabad culture and the salient features of governance. 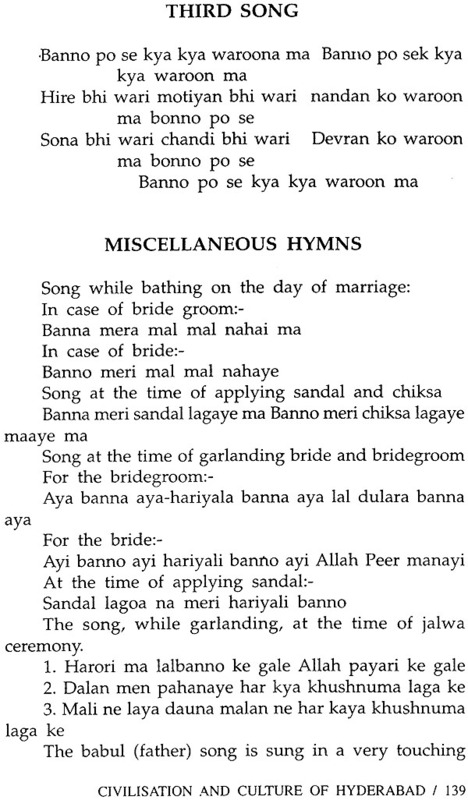 It was decided to translate the valuable material from Urdu to English in order to make it available to the larger section of the English knowing public. Dr. Sheela Raj an eminent scholar translated this book in English and Prof. Satyanarayana Singh, Retired Head of the Department of English, Osmania University has edited and abridged this translation. Both these scholars have taken pains to project the ideas with force and clarity. H.E.H. 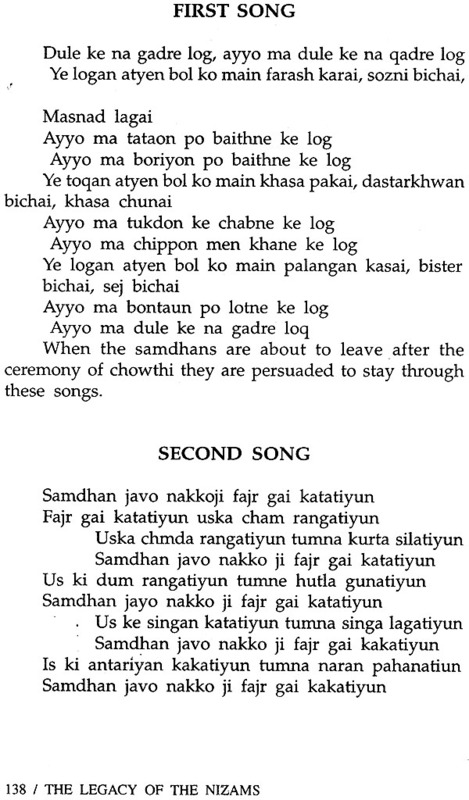 The Nizam's Urdu Trust has published many books in Urdu on different topics. This is the first book in English which is being published with the collaboration of M/s Vani Prakashan, New Delhi. The main idea and aim in publishing the book is to acquaint the present generation with the secular ideas of the State which gave equal opportunities to every religion, caste and community to live in peace and harmony. When the Hindu rulers were in power they gave equal importance to Muslims and when the Muslims came to power they too gave important positions to Hindus and non-Muslims. There was complete harmony among the citizens in all walks of life who shared a common culture, customs, traditions and rituals. It was Nizam-ul-Mulk Asafjah, the first Nizam, who established his Government in Deccan which ruled with honour, dignity and glory for 200 years enjoying the faith and confidence of all classes of people. H.E.H. The Nizam's Urdu Trust feels happy and proud to present this book based on historical data culled from various sources. In conclusion, it is my bounden duty to record my sincere thanks and gratitude to Prince Muffakham [ah Bahadur for his valuable advice and for providing financial assistance to get this book published in English to reach a wider audience. My thanks are due to Dr. Sheela Raj for translating the book from Urdu to English and Prof. Satyanarayana Singh for editing and abridging it. I offer my sincere thanks to Mr. Arun Maheshwari, M.D. M/s Vani Prakashan, New Delhi for having agreed to publish this book and print it within a short time. I must not forget to thank our Trustees Dr. Ali Mohammed Khusro, Mr. M.A. Hadi, Dr. [afar Nizam and Prof. Lakshmi Reddy for their valuable suggestions and advice from time to time in enriching the contents of this book. The Urdu Trust is deeply grateful to the Trustees of H.E.H. The Nizami's Charitable Trust for providing financial assistance from time to time for completing the project. This project was started under the supervision of my predecessor, Mr. Abdul Mahmood and he strove hard for its successful completion. I offer my sincere thanks to him. Last but not least, my sincere thanks are due to those institutions and persons who came forward to provide the requisite information and gave full co-operation at various stages of printing of this book. The present study is neither a historical assessment of the Asaf Jahi dynasty nor a critique of the Nizam's political alignments. It steers clear of controversial issues without passing value judgements on the Nizams' policies and style of governance. 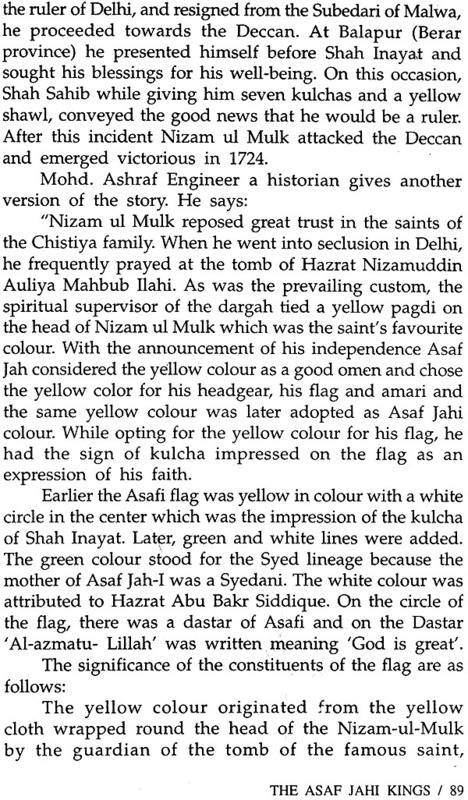 The main compulsion behind such a study on the legacy of the Nizams is to cherish those things that are worthy of remembrance and to treasure such memories of the Asaf Jahi era that will leave an abiding and wholesome impact on posterity. The book is the result of the combined efforts of mostly the alumni of the Osmania University who take pride in the finer aspects of the legacy of the Nizams' rule in Hyderabad, where, historically speaking, different Indian languages, communities and religions not only co-existed peacefully but interacted with one another for mutual enrichment and helped evolve a composite culture that has since become the distinguishing feature of our national identity. 1. The Nizams displayed great statesmanship and foresight in bringing the administration closer to the people and implementing welfare measures for the benefit of the people. 2. 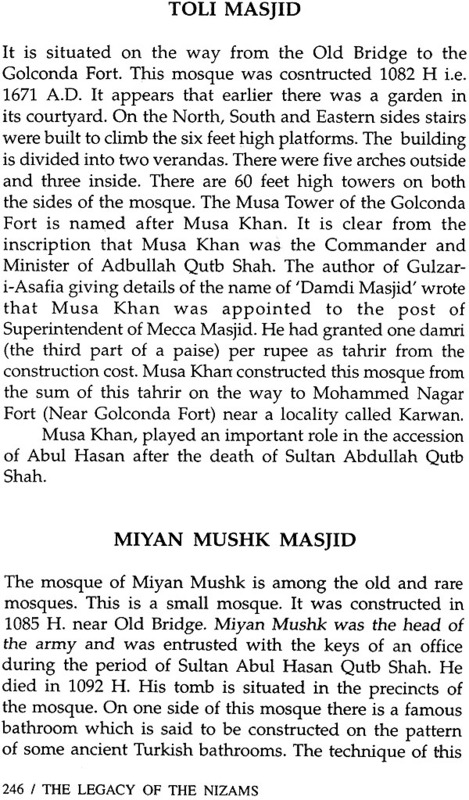 The secular credentials of the Nizarns were in line with the great traditions established by the Qutub Shahi Kings. No historian has blamed the Asaf Jahis for religious intolerance and discrimination. The State was not an Islamic polity in the sense of being a theocracy. There was no official religion of the State. Hindus, Muslims, Parsis and Christians lived in perfect amity and participated with ardour and enthusiasm in each other's festivals such as Ramazan, Moharram, Dushera, Holi, Deepavali, Nowroz and Christmas. The Hindus held the highest positions of power and responsibility in the administration of the State. There is no government order or policy decision or record to show that a member of any community was deprived of a position in Government on the basis of religion. Religion, as commonly understood and practised, served to forge the bonds of unity and fraternity among people of differing faiths. Religion had not become a byword for bigotry to breed communalism and sectarianism causing ill-will between the communities. Tolerance and respect of all religions was the hall-mark of Deccani culture. 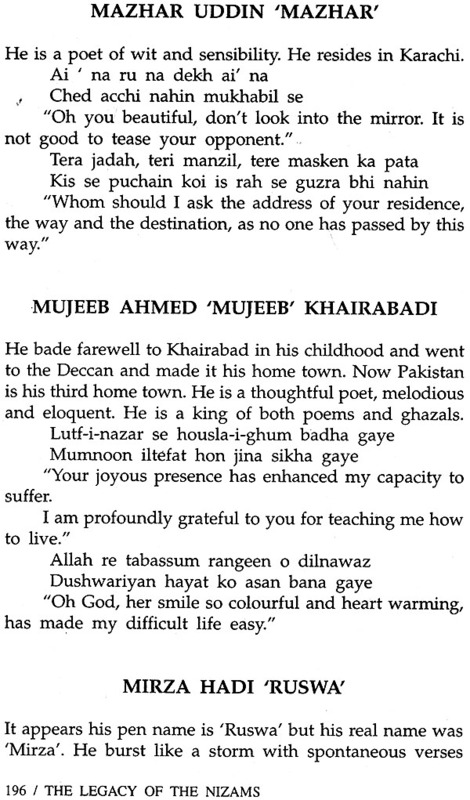 The Hyderabadis were liberal and cosmopolitan in their orientation and outlook. The ethical values that made them respect the worth and dignity of a human being irrespective of class, community, race or religion were the mainsprings of the Deccani ethos for centuries. 3. The chapter on civilization and culture attempts to clarify the factors that constitute the Hyderabadi way of life such as their mode of living, their conduct and behaviour, manner of speaking, food and dress. The two important things that determine the quality of a people's culture are firstly, the general standard of living and secondly, the force of tradition. Extreme poverty or affluence exerts, in the final analysis, a negative impact on human psyche. Extreme disparity in living conditions breeds in the poor discontent, anger and rebellion. Excessive opulence in the wealthy leads to arrogance, greed and exploitation. 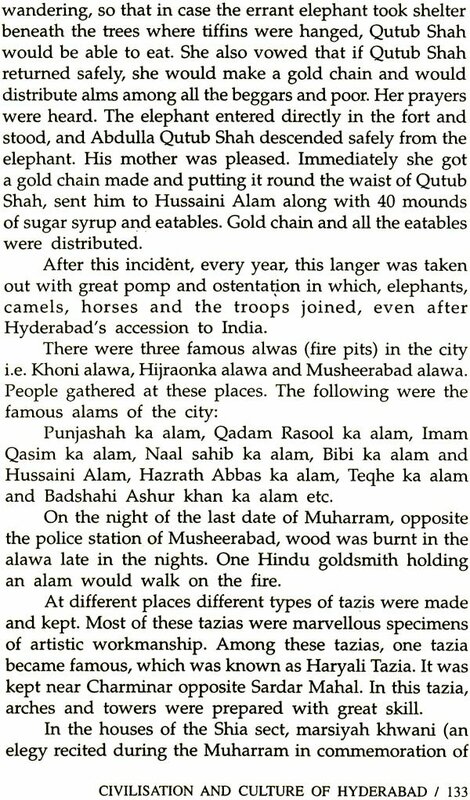 Hyderabad under the Nizams, by and large, enjoyed peace and material well-being. Economic hardship and political instability harm and hamper the progress of civilization and culture. Fortunately the era of peace and prosperity under the Nizams generated an aesthetic and moral resurgence in the field of fine arts and philanthropy. The Asaf Jahis carried forward the tradition of a benign monarchy which was benevolent and people-oriented, not autocratic or anti-people, and which worked for their all-round welfare, progress and prosperity. It is a recognized fact that backing by life-affirming traditions improves the quality of life. Wealth is spent on organising social gatherings, in designing the architecture of buildings, in preparing appetising delicacies and in patronising poets and artists. The feudal structure of society was not without redeeming graces. The social scenario unfolded an attitude of generosity, averse to meanness, arrogance, and narrow mindedness, which permeated all classes of society. In line with this tradition there is a measure of nobility and decency in Hyderabadis which abhors crudity and foolishness. The observance of basic courtesies is integral to their behavioural pattern irrespective of class, position or community. 4. It is not correct to suggest that the Nizam who as conferred the title of "Faithful Ally" was an unqualified admirer or an unquestioning loyalist of the British rule. Whatever be the compulsions or constraints of political expediency in befriending the British, the Nizams from Nasir-ud-Dowla to Mir Osman Ali Khan nourished a dislike, or even anger at the glaring manifestation of the arrogance of British power. The signing of the Subsidiary Alliance in 1798 by Nizam Ali Khan (Nizam-II) resulted in the stationing of British troops in Hyderabad, and the imposition of a British resident marked an erosion of sovereignty. All these came to a head in the Berar question which exposed the colonising tendency of the British when they rejected the Nizam's claim on Berar and attempted to belittle him by proudly asserting their paramountcy. "The British authorities should not forget that it is because of the Hyderabad Government that the British could establish and maintain their rule in India. Being responsible for the welfare of British India they cannot escape responsibility to cope with the situation. They will be well advised to handover the province of Orissa to the management of Hyderabad as Hyderabad cannot remain silent while lakhs are dying in Orissa". The letter, if any thing, reveals the Nizam's patriotic concerns as also his anti-colonial bias, his distrust of the British and his anxiety concerning the sufferings of fellow Indians. 5. 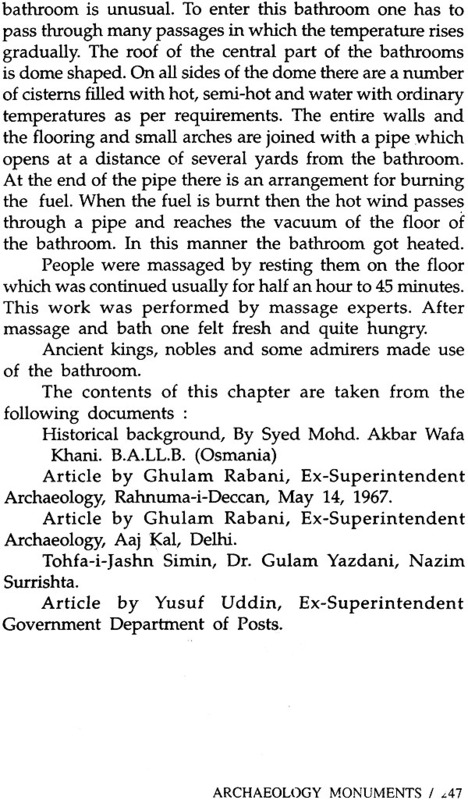 The study underscores in particular the achievement of the first and the seventh Nizam. Nizamul Mulk- I the founder of the Dominion expounded the basic concerns and duties of the kind in his 'Will' - which is rated as an important and epoch making political document. This historic testament consisting of 17 clauses was an unfailing source of inspiration and guidance to the successive kings who at the time of accession solemnly swore that they would adhere to the clauses of the ‘Will’ which in effect could be termed as the directive principles of the State concerning politics, administration and inter-religious harmony.